This week, Raffles Press continues with our very own book review column, in collaboration with MediaCorp’s e-bookstore, ilovebooks.com. In the fourth of a series of fortnightly installments, Belle Teh examines Amanda Hockings’ Switched. 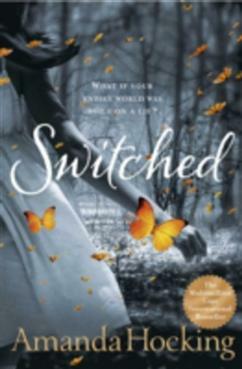 Swithced is a fantasy novel with a dash of romance. It gripped me with the opening line, ‘What if your entire world was built on a lie?’ The story starts out with a flashback from eleven years ago, filled with the intimate thoughts of the protagonist, Wendy, making her a character we can relate to as teenagers. Her experience with her mother is mortifying and leaves readers wondering how a mother can treat her child so cruelly. This is a mother who tells her daughter she is not her child. The next segment of the story describes Wendy in her new school and how she meets a mysterious boynamed Finn who is always watching her. She finds out later that Finn is actually a “tracker” and that she’s not a human but actually a “changeling”. This means that she was a child secretly exchanged with another at birth. She possess a strange and mystical gift called persuasion, which means she can force her thoughts into the minds of others and make them do whatever she wants (duh!). Wendy leaves with Finn to find her real mother and real home, in Forëning. Alas, it is different from what she imagines it to be like. Instead, she finds out that she is the princess of her tribe. She finds it difficult to adapt and escapes from the tribe only to be caught by Vittra, the tribe’s viscous enemy. Left without a choice, she returns to Forëning and throughout her time as princess-in-training, she finds herself even more deeply attracted to Finn. She realises that Finn likes her too but they are cruelly separated by their social status. For those who enjoy romance and fantasy, this story would be a worthwhile read. However, the conversations are a tad lengthy, making the book rather dull after the initial chapters. Nonetheless, since this is the first book of a promising trilogy, the second and third installments will hopefully be more exciting. If Amanda Hockings is reading this, she would do good to provide more in-depth detail of how her fantastical tribe system works and how Wendy would change the rules as the future Queen. The writer’s e-book was sponsored by MediaCorp. To purchase the e-book, please visit http://www.ilovebooks.com/ebooks/home/9D786A38-1F8E-44C3-BE6A-135BD70F35C1/Switched. As part of this collaboration, all RI staff and students are eligible for an exclusive 10% discount from Oct 1 to Oct 4. Simply key in the promo code (SGMPMM120247RIR) at the checkout by filling in the blank, and click APPLY. This week, we continue with our collaboration with ilovebooks.com. Trishala Thamilselvan explores how Wild: A Journey from Lost to Found shows us the true meaning of grit, emotion and a lot of courage.